Exciting times today for the team from MinuteDock (more on them here) the neat little time trapping application from my own hometown, Wellington, New Zealand. Formerly a product that was primarily intended for users of the Xero accounting product, MinuteDock is broadening its approach and is now tightly integrated with QuickBooks Online also. 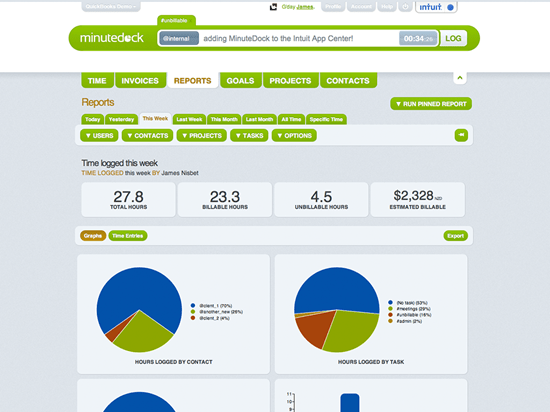 MinuteDock costs $18/month for the first user and $3/user/month for each subsequent user. There are also bulk plans for 50 seat implmentations at $105 per month. The integration for us is just a natural expansion – we already do Xero and FreshBooks, and QuickBooks online is a very big player in the Online Account Software market, although very US-centric. We’ll likely be adding more products in the near future. MinuteDock is a lovely little product and it’ll be interesting to see the traction it gets with the QuickBooks integration.